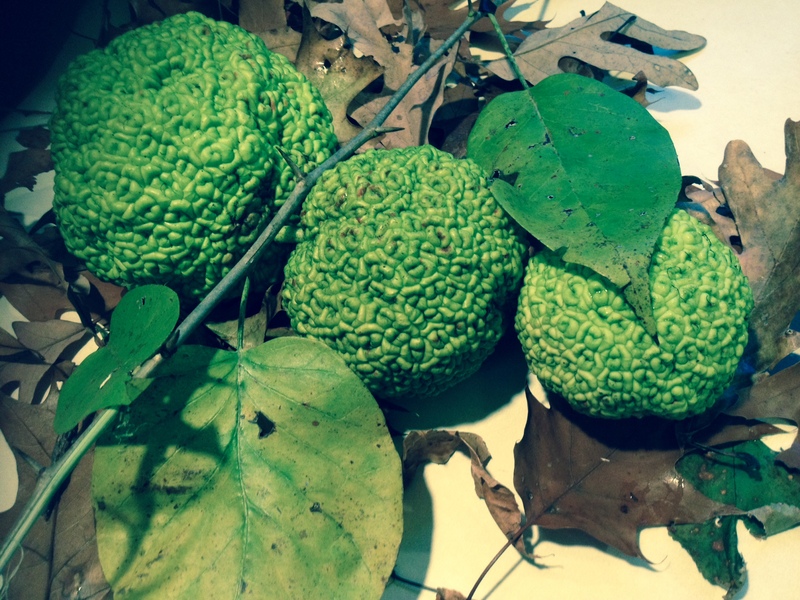 In the fall, walking along roadsides, old home sites, or the edges of fields, one often comes across a strange looking, greenish-yellow, round and rough-surfaced fruit on the ground; it is from the Osage Orange tree, Maclura pomifera. We have chosen this unusual, very tough, native American tree to be the November Tree of the Month. The Osage Orange tree was once found primarily in the Red River drainage areas of Texas, Oklahoma and Arkansas, in blackland prairies and post oak savannas and was originally used by the Osage and Comanche Indians to make bows and war clubs. It was naturalized extensively throughout the country from the Rocky Mountains to the East, North of Florida to Ontario, by the efforts of early American settlers as well as the native Americans who would travel hundreds of miles to gather the wood for their bows and clubs. The wood was unequalled for prickly hedgerows, windbreaks, posts, fences, furniture, tool handles, and railroad ties in addition to archery bows. It has been planted in greater numbers than any other native, American tree, and recently has been used for strip-mine reclamation as it is so site-tolerant. It is hardy from USDA Zones 4-9 (Ewing is USDA Zone 6b). The fruit, which ranges in size from 4” to 6” in diameter, is actually a group of fruits, each with a seed, all covered within a rough, round, yellow-green rind. The “orange”, which has no relation to citrus oranges, is filled with white, bitter, milky juice which can be irritating to the skin; it is not poisonous, but has a chemical-like flavor and unpleasant texture. It is not readily eaten by animals, but squirrels do eat the seeds. The Osage Orange fruit is very messy on the ground, and beware of standing beneath a fruitful, female tree in an autumn wind when the fruit is ripe! This tree ranges in size from 20’ to 40’ although it can reach 60’. It is fast growing, has a short trunk, and develops a rounded canopy. The trunk is deeply furrowed, an ashy brown to orangey brown, and has scaly ridges and deep fissures. The leaves are alternately arranged, smooth-edged, bright green above and lighter and fuzzy below; they are 2”-5” long and half as wide. Sharp, 1” thorns develop in the axils of the leaves. The fall color is bright yellow-green. Osage Orange is dioecious, meaning that male flowers are borne on one tree and female flowers on another. It is wind pollinated. The inconspicuous male and female flowering usually occurs in June when the leaves are fully developed. The wood, has many uses as it is exceptionally rot resistant, very hard, heavy, immune to termites, flexible and strong. It is said to have the highest BTU content of any commercial U.S. wood and it burns long and hot (never use it without a screen, however, as it pops sparks for long distances). Fence wood used to be installed green, as the dry, seasoned wood was too hard (said to be 2.5 times harder than white oak) to accept nails and staples. The wood is straight grained; several dyes can be extracted from it. This is obviously not a residential or street tree, but is picturesque in natural settings and parks, and is a valuable habitat for pheasants, quail, and other birds. Male tree varieties are favored and available as they do not bear the messy “oranges”. Osage Orange is tolerant of almost all soils and conditions and is not favored by pests and diseases. It thrives, however, in moist soil and full sun and prefers no competition from other trees. During the Great Depression, Franklin Roosevelt, with the W.P.A. project “Great Plains Shelter Belt”, had many miles of Osage Orange trees planted as wind breaks to modify the weather and erosion. Until barbed wire was invented in the 1870s, prickly, dense, Osage Orange hedgerows, tightly pruned, were used to keep pasture animals contained. Remains of these can be seen today around Ewing. Meriwether Lewis, of the famed Lewis and Clark expedition to the west in the early 1800s, sent slips of Osage Orange to Thomas Jefferson. The scientific name, Maclura, is named after William Maclure (1763-1840), a Scottish geologist who was president of the American Academy of Natural Sciences in Philadelphia for twenty-two years.